As I usually do, I started with a digital sketch. 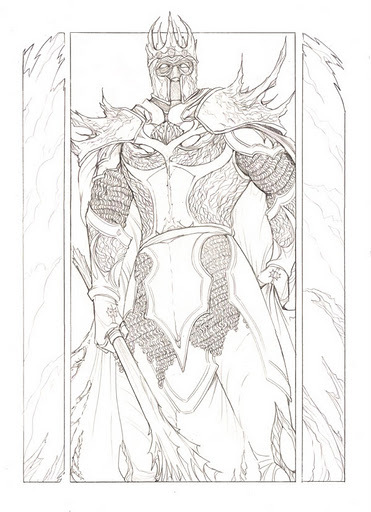 I debated for a while whether I really wanted to give him the ubiquitous Evil Overlord Shoulder Spikes, but then I decided Evil Overlords needed those, desperately. 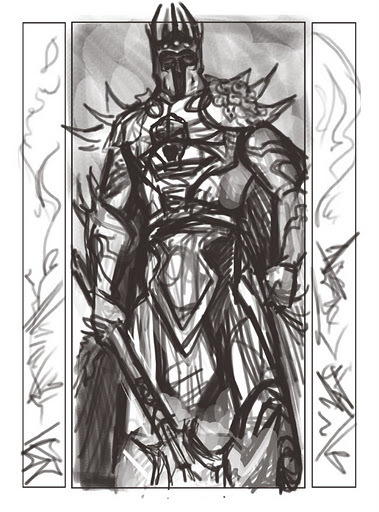 What I decided he could do without was the skull on his breastplate. He even had skulls on his knees temporarily, but he doesn’t strike me as the flashy sort who’d try to intimidate his enemies (or servants) with skulls on his kneecaps. I mean, he doesn’t need that, does he. 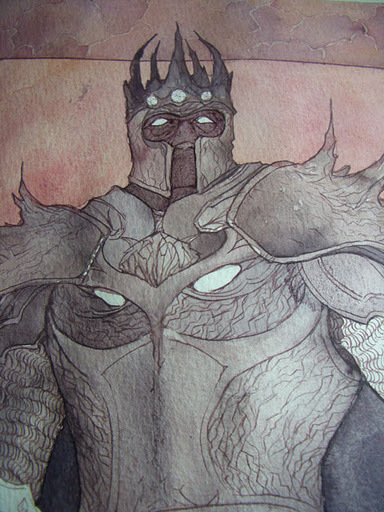 In the lineart, I suddenly realised that I had envisioned Morgoth as stony ever since I first read the Silmarillion, though I had never been aware of it. But all those comparisons to hills, mountains, caverns in the Silmarillion and the Lays of Beleriand were just too strong to ignore. That just goes to show how little I manage to truly see characters in my head. My desk, all new and shiny and laid out for several days of painting. Print-outs of the sketch and a quick digital colour mockup lean against the wall. On the left hand side: provisions like crisps and coke. 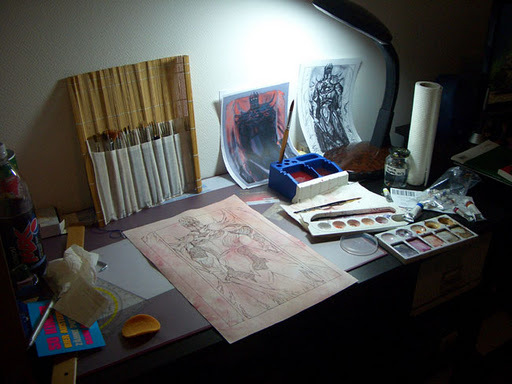 On the right: drawing materials, such as paints, tissue, brushes, and vodka. What? Oh no, you did read that right. 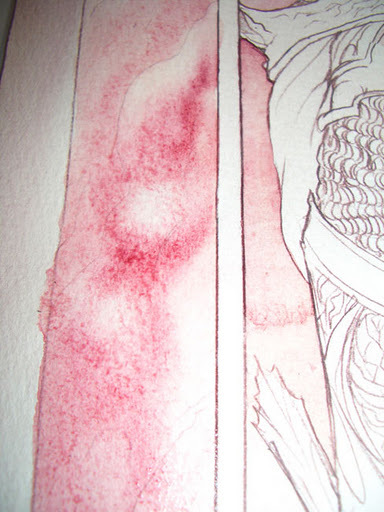 The first wash of paint: pale red (mostly Alizarin Crimson) and a lot of water. Some more vodka is put to good use. The middle and side panels are painted. I’ve also added some jagged, stony spires at the bottom. 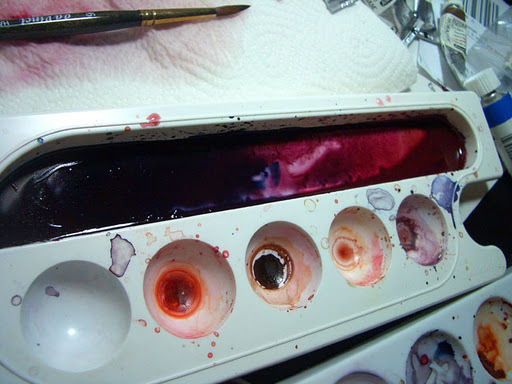 For the frame, I mix a couple of different purple hues from varying amounts of Alizarin Crimson, Magenta, Burnt Sienna, Ultramarine, Indigo, and Sepia. (Which is all the colours used in this pic.) I kept them separately in my palette. I wanted a stony texture, so I painted jagged “tiles” and used different hues for adjacent ones. By putting an ink jar underneath my painting, I got it to lie on a slightly slanted surface. Thus, the paint pooled at the bottoms of the tiles, creating an interesting 3D effect. So, a darkening and dulling of colours was very much in order. 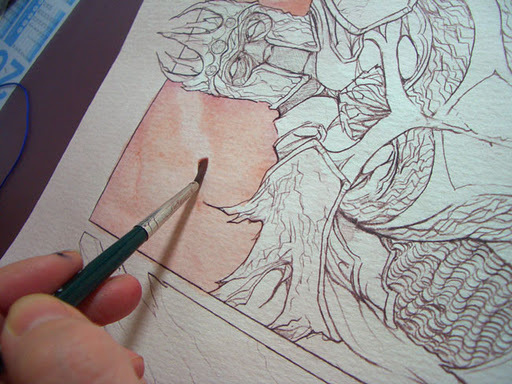 If you’re going to add a glaze over an existing painting, and if you plan on keeping the textures and edges you’ve already painted, you should use a soft brush. My usual synthetic brushes are too hard; they would have rubbed off all the edges I had. 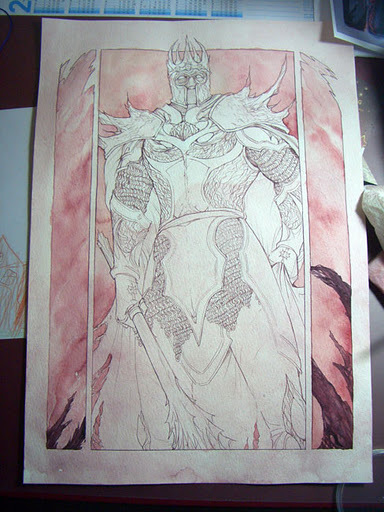 I used a soft sable brush, and thus most of the work I’d previously done remained intact. For the glaze, I used Sepia, Indigo and some Yellow Ochre, for a truly dirty wash that would get rid of all pink fuzz. 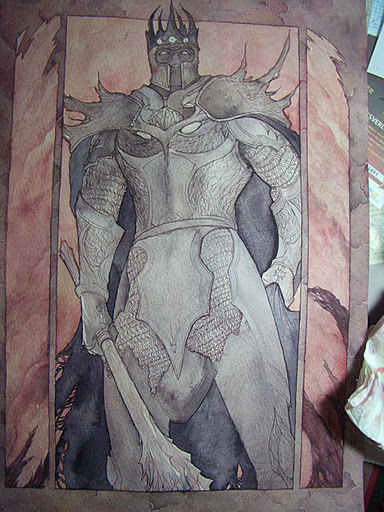 Going from light to dark as usual, I put in the first block of colours for Morgoth, modelling some areas already. I used pretty much the same mix of colours (minus Ochre) I already had for the frame, though heavier on the Sepia side – as always in my paintings, no black was used. 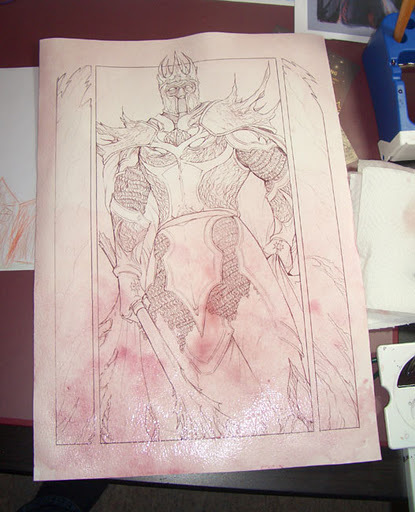 I did make use of the pure white of the paper, as opposed to my usual approach – the Silmarils in his crown were deliberately left mostly white. The first colour-blocking job finished. The second, darker, colour layer. 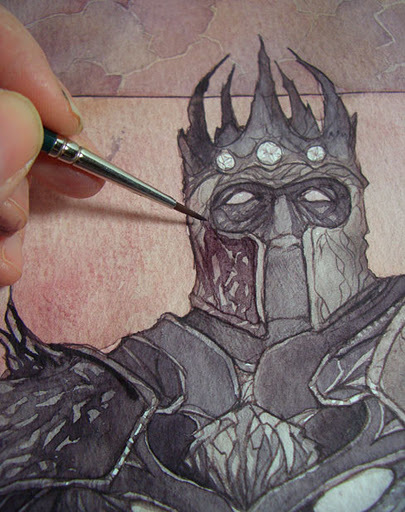 Here I’m painting the stony structure of his helmet. 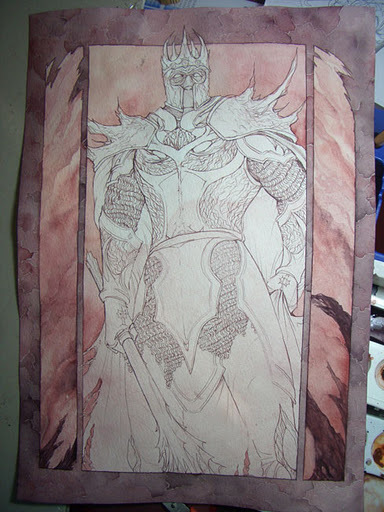 Usually, I have two to a maximum of three layers in every given area of a painting. In this one, I had as many as six in some places, to add depth and darkness. You’ll note that there is a lot of detail and contrast between lighter and darker edges in his upper body (the strongest in his face) and hardly any contrast at all in the lower half. 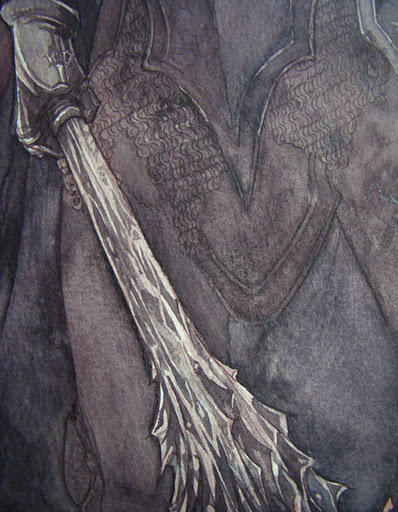 That way, the eye is directed up – as Fingolfin’s must have been, staring up at his massive foe – and isn’t distracted by shiny objects on belt, knees, or other nether regions. So, we want none of that; hence, no detail in areas of the pic where the watcher is not supposed to dwell. 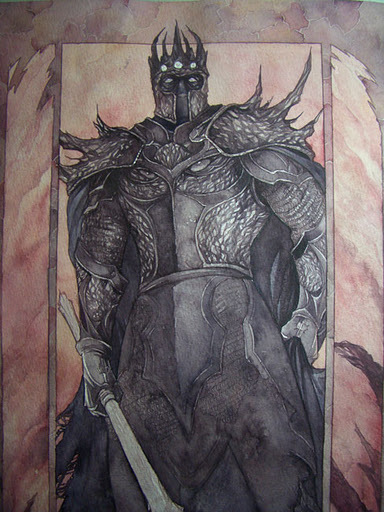 Looking at the above stage, I found that the S-curve in Morgoth’s cape on the left creates an awkward sort of shape. I decided to make it sweep out of the left margin, to add more bulk and firmness to his stance. I augmented that effect by adding some more jagged stones jutting out in the left side panel, also leading the eye inwards and up. 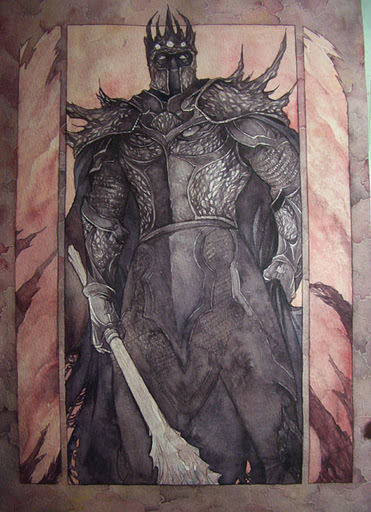 The only detailed bit in the lower half of the pic was always supposed to be Morgoth’s mace, Grond. So I left a lot of areas where just the very first reddish layer shows (which looks almost white here but isn’t) and added very dark stony greys for that angular, spiky look. No soft transitions, only harsh edges. 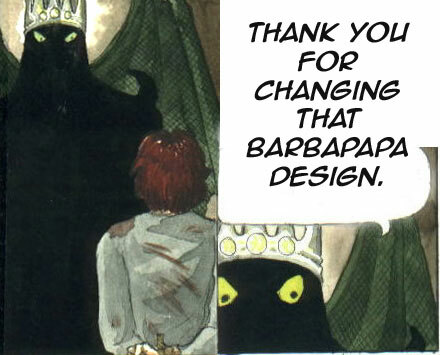 … and I told you. This has been an awesome walk through, really informative! One question I do have though: what sort of paper do you use? I have tried a few different ones but the more I paint over them they tend to get all "hairy". Have you used watercolour paper? There are several reasons why the paper wears out: 1) You're using very cheap watercolour paper.2) You're using too thin watercolour paper (less than 200g). 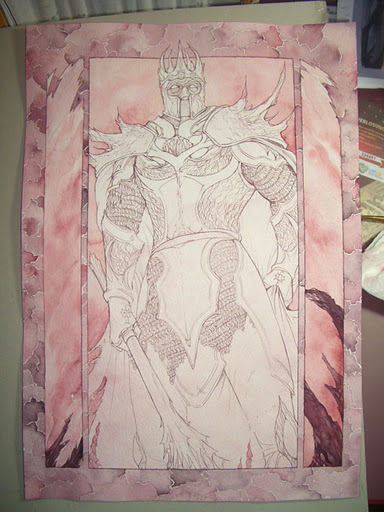 3) You're not using watercolour paper at all. ;)4) You're using too-hard brushes. 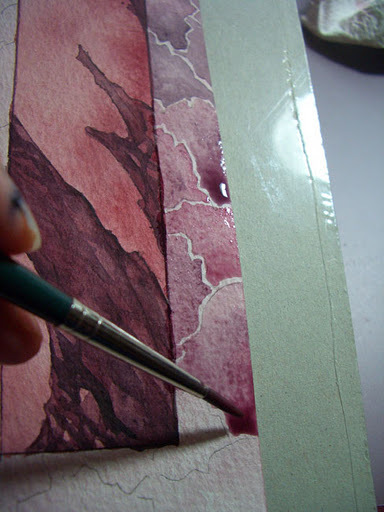 5) You're go over the same spot too often while the paper is still wet.Or any combination of the above. :)Hope this helps! I think the last bit sound right for me, I tend to be a little impatient with my work :) Thanks for the tips! I might take a look at some really heavy paper too.